PhD candidate Dolly Goldenberg captivated audiences in the Yale McDougal Graduate Center’s second annual 3-Minute Thesis competition, finishing in third place. Her presentation, “Hearing with our skin: multisensory integration in speech perception,” discussed the relationship between language and the five senses. Although we primarily perceive speech sounds using our sense of hearing, the auditory signal we receive through our ears is often filled with noise. To ensure that we can hold a conversation in spite of all the distractions that are happening around us, our brains incorporate as much information as possible when trying to identify the sounds and words that we are listening to. Sometimes, this extra information might come from unexpected sources, such as our sense of touch. 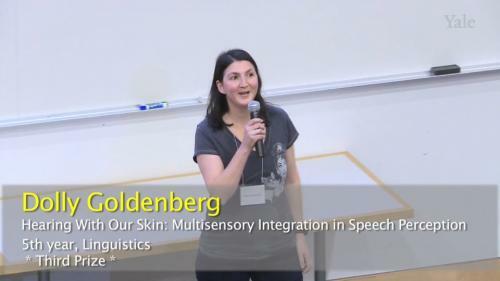 As part of her dissertation work, Dolly conducted an experiment with Senior Scientists Mark Tiede and Douglas Whalen of Haskins Laboratories demonstrating that the things we feel on our skin can influence the way we perceive speech sounds. In her experiment, Dolly considered two consonants: the b as in bin and the p as in pin. These two consonants are very similar to one another. Both are produced by closing the lips, building air pressure using the lungs and diaphragm, and opening the lips to release the air pressure. The main difference between the two consonants is that p requires a greater level of air pressure than b. Because of this, the p sound includes an audible puff of air occurring after the lips open. There is no such puff of air for the b sound. For the experiment, Dolly, Mark, and Douglas created a recording of the p sound and a recording of the b sound. They then created several other recordings by modifying the duration of the puff of air in the p sound. When the puff of air is long, the modified recording sounds more like a p than a b; when it is short, the modified recording sounds more like a b than a p. Participants in the experiment were asked to listen to these recordings and decide whether they are listening to a p or a b. Occasionally, they would also be exposed to a puff of air on the skin. Regardless of whether they felt air on their skins, participants always correctly identified the original recordings of the p and the b sounds. However, when presented with the modified recordings that sound like they could be either consonant, participants that felt the puff of air were more likely to say that the sound was a p, while participants that did not feel the puff of air were more likely to say that the sound was a b. In other words, the participants were using their sense of touch to decide which sound they were listening to when their sense of hearing did not provide enough information. In honor of her third-place finish, Dolly received a $200 gift certificate to the Yale bookstore as a prize. The second-place award went to Lydia Hoffstaetter of the Interdepartmental Neuroscience Program, and the first-place award went to Beza Getachew of the Department of Chemical and Environmental Engineering. Dolly, Lydia, and Beza’s presentations can be viewed online for free. The 3-Minute Thesis competition is a fun way for PhD students to practice presenting their research to a broad audience. Because PhD programs require students to complete original research in their areas of study, it is often very difficult, yet also very important, for students to communicate their ideas to people of other backgrounds, including other scholars, funding agencies, potential employers, or friends and family. Any Yale PhD student working on their dissertation is eligible to participate in the 3-Minute Thesis competition. A total of 82 students signed up, and after a preliminary round, the three winners were chosen from eleven finalists. More information about this year’s competition appears in a Yale Daily News article.